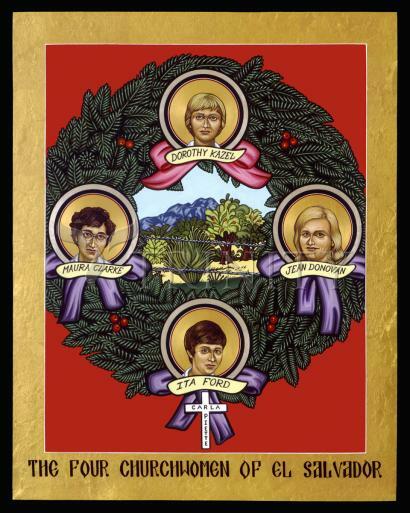 December 2, 1980, this became the fate of four women; Maryknoll sisters Ita Ford and Maura Clarke, lay missioner Jean Donovan, and Ursuline sister Dorothy Kazel. These gentle, loving women, living out their commitment to God’s preferential option for the poor, were raped, shot and their bodies left, bruised and naked, by the side of the road. They were American faces amongst 75,000 native Salvadorans, victims of a brutal civil war. In this icon, they stand as reminders of the dignity and beauty of all those innocent victims of greed and oppression. In this image, the Advent wreath serves to commemorate not only when they died, but also to remind us of this season of hopeful expectancy, yearning for the arrival of Christ’s presence on earth. These women prayed for Christ’s presence amongst so much senseless violence. They learned here, even the Gospel was considered subversive. In the circle of the wreath, the women’s portraits replace the traditional candles: they offer us a glimpse of eternal light. The ribbons represent the color of the candles; three violet ribbons represent sorrow, and one pink, for the third week of Advent, represents the joy we experience with one week till Christ’s birth. I picked Dorothy for this ribbon as she was very joyful, and was the third body unearthed from the temporary grave. The wreath itself is made of evergreen branches, symbolic of life. In the center is a stylized view towards the mountains from the site of their temporary burial, emphasizing the beauty of creation. The barbed wire is evidence of boundaries as land disputes were at the root of so much injustice in Central America. The white cross at the bottom is in memory of Ita’s good friend, Sr. Carla Piette, who drowned two months before Ita’s death, pushing Ita free from their jeep that had been caught in a flash flood. The white cross and black lettering are used by protesters of the School of the Americas at Ft. Benning, Georgia. On December 2, 1980, members of the National Guard of El Salvador intercepted the van carrying four American churchwomen as they were leaving the international airport in San Salvador. Maryknoll Sisters Ita Ford and Maura Clark, Ursuline Sister Dorothy Kazel, and lay missioner Jean Donovan were taken to an isolated spot where they were shot dead at close range. Ita Ford and Maura Clark worked in Chalatenango and were returning from a Maryknoll Sisters meeting in Nicaragua. Dorothy Kazel and Jean Donovan had come from La Libertad to pick up their missioner friends at the airport. All were working in the country on behalf of the Archdiocese of San Salvador, helping refugees flee the violence of the erupting war. The U.N.-sponsored report of the Commission on the Truth for El Salvador concluded that the abductions were planned in advance and the men responsible had carried out the murders on orders from above. It further stated that the head of the National Guard and two officers assigned to investigate the case had concealed the facts to harm the judicial process. The murder of the women, along with attempts by the Salvadoran military and some American officials to cover it up, generated a grass-roots opposition in the U.S., as well as ignited intense debate over the Administration’s policy in El Salvador. In 1984, the defendants were found guilty and sentenced to 30 years in prison. The Truth Commission noted that this was the first time in Salvadoran history that a judge had found a member of the military guilty of assassination. In 1998, three of the soldiers were released for good behavior. Two of the men remain in prison and have petitioned the Salvadoran government for pardons. The families of the four churchwomen continue to pursue a lawsuit in U.S. federal court against the former Salvadoran generals retired in Florida, who were senior government officials in El Salvador at the time of the killings.